Install drawer slides quickly, accurately and more easily than ever with this innovative jig! 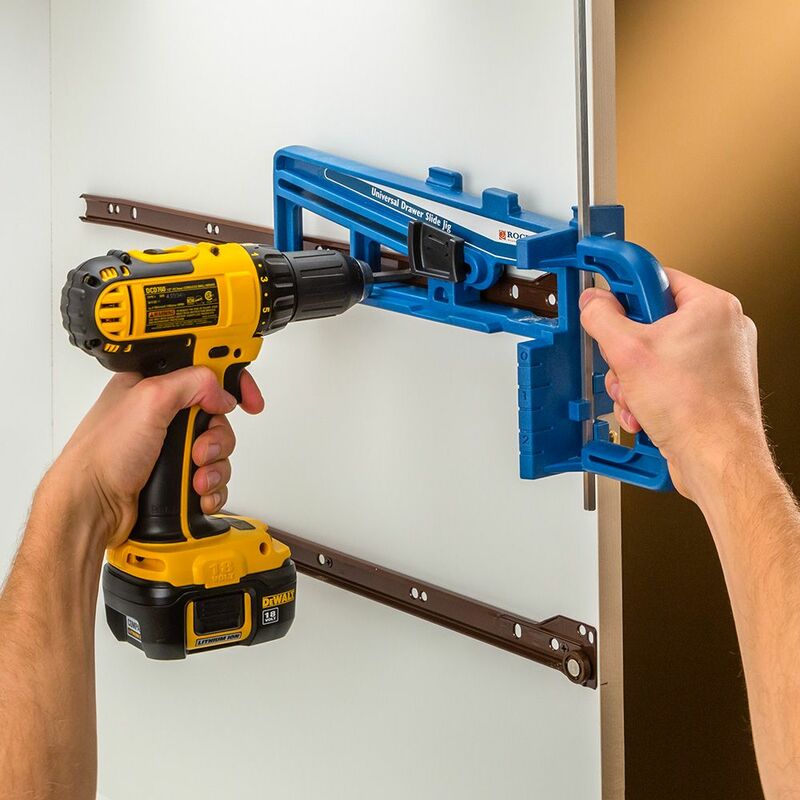 The Rockler Universal Drawer Slide Jig is the ultimate aid for installing drawer slides of almost any type, including ball-bearing or epoxy-coated side-mount slides and even center-mount slides! 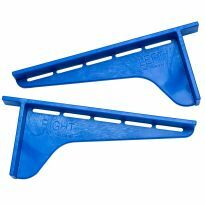 The jig features a locking wedge that holds the slide securely with no risk of slippage. Press the jig against the face of your cabinet and your slide is positioned perfectly level, with the proper setback. The jig can be clamped in place if desired, and it also features an adjustable rod that references off of the face frame rails or cabinet bottom for fast, repeatable height settings. Not compatible with Blum Tandem Drawer Slides. The maximum drawer slide height that this jig can accommodate is 1-3/4 inch. End Height: 4 1/4 in. Working Length: 10 7/8 in. It works good. It makes installing drawer slides faster and easier. Love the Rockler drawer slide jig. I first time ever putting drawer slides in. Once I understood how to use the Rockler drawer slide jig. All slides went in perfect every time. I could hold the jig with one hand and drill the screws in the slides holes with the other hand. Perfect every time. Makes installing drawer slides very easy and quick. as stated it easily set up your draws for proper alignment and straight 90 degrees. It easily lets you drill the properly. I fought buying this for a while since you can install the drawer slides without a jig. However, after getting frustrated while installing the first of 9 sets of drawer slides on my current project, I decided to pick one up. The next 9 sets went on in about the time it took me to do the first set without a jig. My only issue was trying to figure out why I hadn't bought it earlier. Incredibly usefule jig. Love it. Very satisfied. Makes an awkward task very simple. Worked well in a tight space. I purchased this jig last fall. I just used it to install slides in a new custom cabinet I’m building for my shop. Awesome jig. I sure wish this jig had been available years ago. It aligns and holds the slide until you secure it. 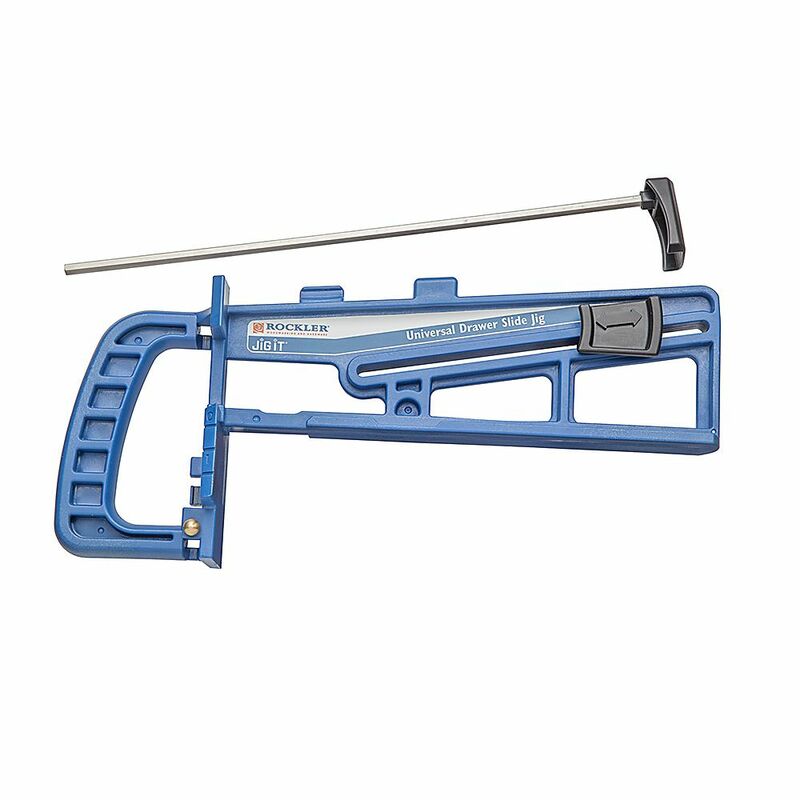 I will recommend this product to all Rockler customers. Best designed drawer slide installation tool so far! Right now I have only used this tool on a couple of drawer slides. It worked fine. 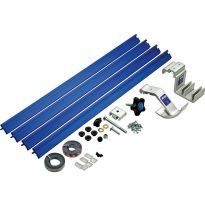 The Kreg jig I purchased a few month ago will not fit into cabinets and furniture with dust panels, and restrictions prohibit it to be used in most applications. So, after a few month of use I will evaluate this further and respond. 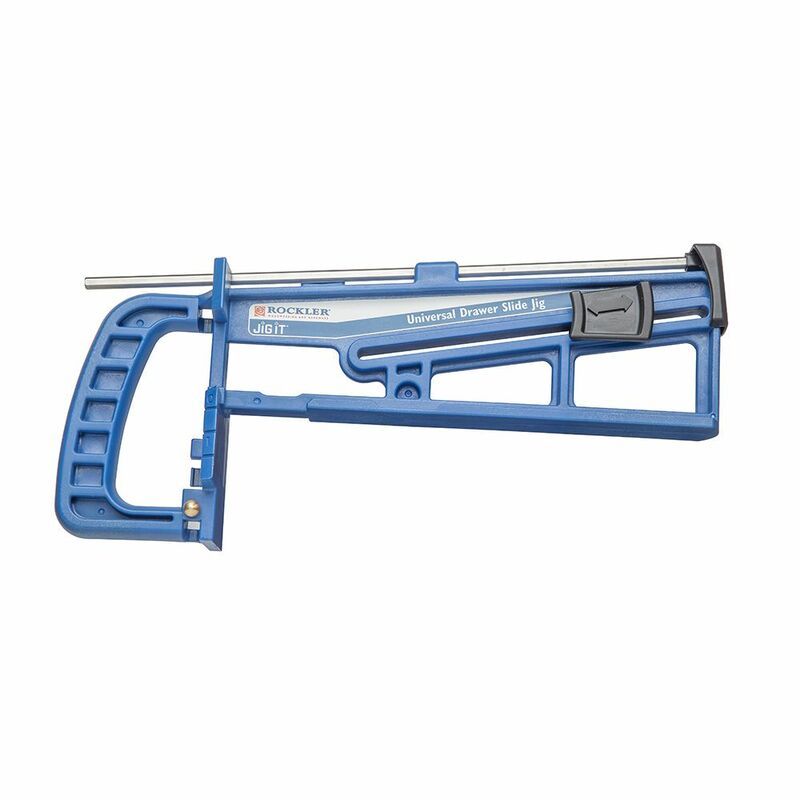 Rockler presently has the best tool on the market. Works great. Speeds up installations. I really haven't had a chance to use it yet but it doesn't look to complicated and it should help me to put the drawer slides in, thank you Rockler for having this product, it should come in handy in the future as well. 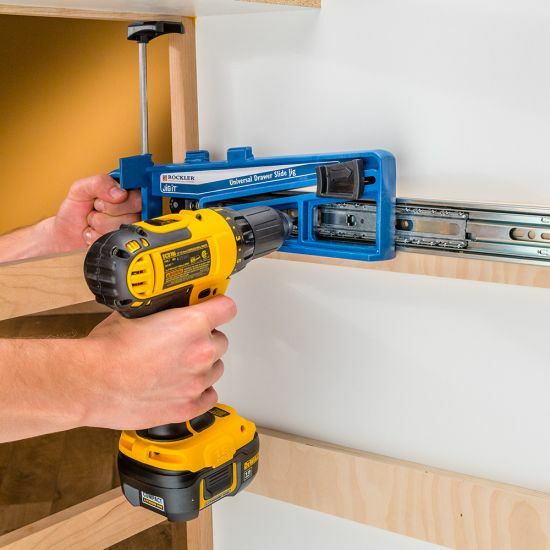 Affordable, easy to use jig makes drawer slide installation quick and simple. This jig works well and is definitely universal. Awesome. I can't wait to use it on the cabinet I'm building. This jig makes installing the glides a snap. Wish I would have bought it years go. It sure beats trying to hold the drawer slide level and in place without it moveing all over the place. Just as good as ,it is. This is a very handy jig to have. Climbing or reaching into small cabinets can be clumsy and uncomfortable, especially when trying to work both arms in to measure and mark for the drawer slide. This jig simplifies that job significantly. This is very well made, and works great. I had over forty five drawers to install and it was as easy as picking cherries using this tool. In my wood working shop / man cave, I have built a lot of shelves and storage drawers. I used to measure the height on each side and put the pull extension brackets in one at a time. It used to take a while to do them. But now with the Universal Drawer Slide, I make my marks, but the jig holds the slides in place easily and I can attach them. It does take a little getting used to balancing the jig and a screw on the drill bit, but it is a nice jig to have. I don't know why I didn't buy one of these sooner. Works really well all marks are spot on and easy to hold why you put in the screws. This is definitely a time saver, thanks I should have gotten it sooner! Worked great! Quicker alignment/positioning of drawer slides. Used along with the Drawer Installation Beackets & saved time and tweaking! Worked great. Used 28' full extension glides. Best install I've every had. This Jig freed up a hand to make it more managable to install the drawer slides. Especially for a 70 yr old Rookie. This is a great tool to simplify your life. Exactly as described. Made life easy. Will never install drawer slides without this now. Very easy to set up and use right out of the package. Works really well. Don’t overlook the spacer rod. It really makes alignment (top to bottom) fool proof. Makes quick work of installing drawer slides. Mine came damaged (box corner was crushed). Called Rockler and they sent a replacement out - shipped the next day. Very happy with the jig and Rockler support. If you are doing drawer slides this is a must! Saw it used in a video. David Picciuto - "Make Something" - demonstrated this. I have a project to build which will have numerous drawers. This seems a good way to get them to function well. Hope this works as advertised. To make sure all drawers are level! Question! That just one Jig is good for the left and right side? Building multiple drawers in the night stands I am building. I needed this for building cabinets. 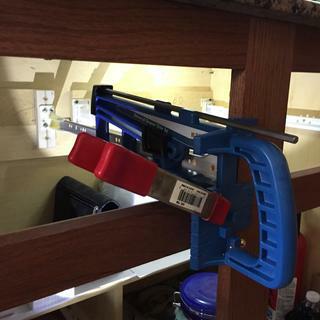 To mount drawer glides in my new shop cabinets; it will make it much easier. Works good enough. About $20 on sale saves me money over making my own jig. 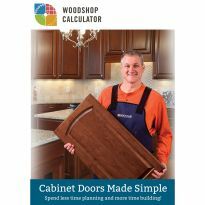 I'm going to be building kitchen cabinets and think it will make the job easier. Never installed side mounting hinges. Looking to make the job much easier. Hopefully it will be easier to accurately install drawer slides. 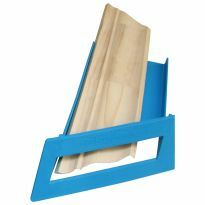 have the two projects for drawers (kitchen cabinets and vanity) and this will make putting the slides on a lot easier. 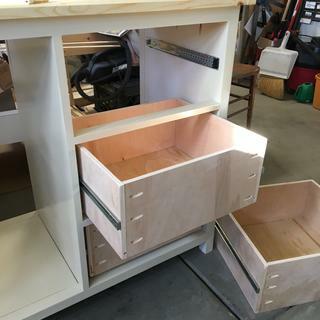 with many other projects coming with drawers couldn't pass on the deal. I need to install glides efficiently with repeatable results. Seemed to be better than the Kreg guides. But, couldn't find the Kreg face frame clamps in you on line catalog. I needed the jig for an upcoming project and I recently saw it used on an episode of Ask This Old House. Will make drawer slides installation easier. I haven't tried it yet, but it looks to eliminate a headache. Can anyone tell me if this works for installing the BLUM undermount slides? Thanks ahead of time! How does it work for inset drawers? BEST ANSWER: You're going to have to mark the inset and put the front of your runner on that line. A little more work, but still easier than the alternatives. Installation video shows details of installing the inside half of the drawer slide, then stops. How about completing the installation by showing how to accurately install the remaining half of the slide to the drawer? BEST ANSWER: the jig is for mounting the slide to the wall of the cabinet, which is often difficult to get one's body into to accurately hold, and maneuver tools. slide, screws, driver, light, etc plus your body leaning on an elbow, as as most people are not ambidextrous one side is always harder to mount than the other side. You don't need the jig for the slide portion that attaches to the drawer. It is assumed that the drawer can be laid or stood on edge on a work bench where you have easy access. Further the position of the slide on the drawer determines where the drawer lands when installed. The best way to do a slide install, is to position the fully assembled slide on the side of the drawer and draw a line along the top and bottom edge of the slide. Then measure from this top line to the top of the drawer face, and use this dimension to determine where the top edge of the drawer slide will be mounted to the cabinet wall (make sure to include the necessary clearance gap between the top of the drawer face and the front support bar/rail of the cabinet. Then disassemble the slide, mount the larger/wide section to the cabinet wall, and then mount the smaller/inside slide section to the drawer (it will lie halfway between the upper and lower of your lines). To allow some adjustment to the drawer closed position, only install a few screws in the slot positions, test the drawer, adjust either/both of the slides to make the drawer close as you wish, then add screws in 'fixed' holes to make sure that the slides don't move with drawer use. I made a single piece of wood 1 inch wide and 22 inches long that the slide part sits on and is the right dimension for the slide part to ride in the slide. On the wood jig piece I put two dowels close to the outside edge to hold the slide while I drill and screw the slide to the drawer. It works very well. Mounting holes for the Accuride 3832 slides with the face frame conversion kit can not be accessed? BEST ANSWER: You only need the front and rear screws to secure the runner. Then remove the jig and put in the rest required. Do I need these in addition to the Universal Drawer Slide jig? What about the Undermount Drawer slide jig? I'm a confused newbie. BEST ANSWER: if you are installing side mount drawer slides these do make it easier. 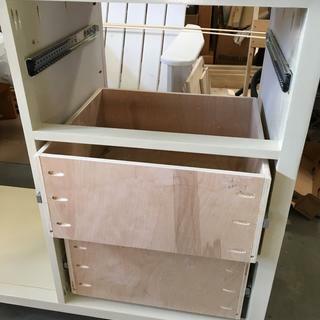 After you have used the drawer slide jig to install the slides to the cabinet box, you use the brackets to hold the drawer box in the proper position for screwing the slides to the drawer box. If you don't have the brackets then you need to take the drawer slides apart, and measure both sides and attach the drawer part of the slide to the box. It takes longer but is not hard to do. You do not need the Undermount drawer slide jig at all if you are using side mount drawer slides. You do not need the drawer slide installation brackets at all if you are using Undermount drawer slides. On Undermount drawer slides the drawer box just sits on top of the Undermount slides and snaps into position, no measuring. 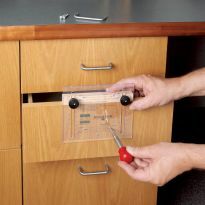 The Rockler Undermount jig is for undermount slides, typically Blum and the drawer sits on the slide. Totally different slide and install. Side mounts have 2 components, one attached to the drawer, the other to the cabinet. 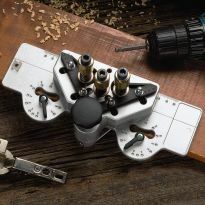 The Rockler Drawer Installation is to help install the drawer component in the correct position, the Universal Drawer Slide Jig is for the cabinet component. Does it work with cabinets having a face frame? BEST ANSWER: I was able to clamp the jig to my cabinet face frame. I ended up using a vise grip clamp that is used with the Kreg pocket hole jig. I found this style to work the best. 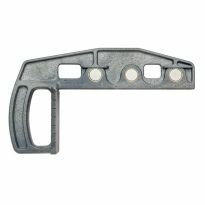 When using the Accuride face frame conversion kit, the jig does not allow access to the holes in the front clip bracket. Yes. It will work well with face frames. Remember the horizontal supports for your draws need be be even thickness with the face feane. But it works well. What is the minimum size opening the slide will fit into? BEST ANSWER: The minimum opening on the Rockler Universal drawer slide jig is 3/4"
For vertical clearance, the jig flairs larger to a height of ~3 5/8" from the stem (handle end) ht. of ~2 3/4". If there is space above and below behind the face frame, the jig might be inserted sideways if there is vertical clearance for the flared end. Jig is 10 3/4" deep to allow the jig squaring face to set against the face frame. The important note above says that it will only accommodate a drawer slide that is a maximum of 1.75" high, but every drawer slide I find is 1.8. Will it fit those? It appears you have to purchase two jigs? one left and one right or can it be used for both sides? No the jig will hold a slide on either side. It can be used for both sides. I purchased this jig and attempted to use on push to open slides. It doesn't seem to work because it sets the front of the slide back. The insteuctions for the slide says the slide has to be flush with the front of the face frame. Has anyone used this jig successfully with the push to open slides? BEST ANSWER: I purchased this same drawer slide jig also I know when they say flush to the face front I kept mine flush to thee inside of the face frame so the slide glide by the face with about 1/8 clearance on both sides. Push to open slides may require a little trial and error to get it right. Good Luck. Does this jig work with standard under drawer mounts (the earlier question specifically addressed only BLUM under drawer mounts)? How do you line up the drawer with the slide for mounting, after you use the universal drawer slide jig? BEST ANSWER: Well if you bought the same slides I bought it came with very specific instructions on how to do just that. If your one of the people who think you don't need the instructions think again. It has been some time since I put mine in but I do remember one very criticle step was to be sure you have them turned in the proper direction. Hope this helps. Most important of all is the instructions for both the jig and the slides themselves. You will need both. Hi there. Is this jig available in metric measurements or only feet and inches? I see a lot of negative comments on the slide holder. Is this something That has been addressed? BEST ANSWER: I have used the jig in impossible situations and have had no trouble with it. The main thing I have to say is that you have to follow the instructions. I will admit that the instructions are a little lite, could use better explanations. 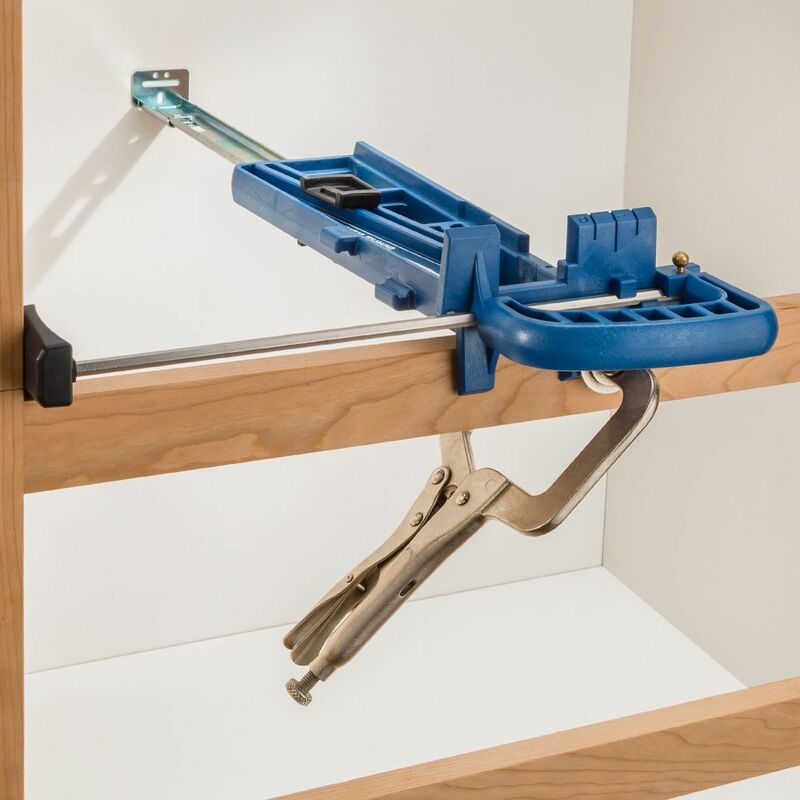 Hi, Which Kreg´s clamp recommends to use with the universal drawer slide jig for better support on the wood? just received the jig today and upon opening and checking it out, the adjustable guide for height does not work as the plastic guides are misalligned and the rod will not slide past the first guide as one pushes down... as the rod is stiff, there is no way to pass this guide...any suggestions??? BEST ANSWER: It's hexagon shaped and the plastic has some give. Take your time and work it. I see that Rockler says the jig only works for slides up to 1 3/4" wide. A common width for drawer slides is 1 13/16" (1.8"). Will this jig work with a slide that wide? I would suggest go to Home depot and purchase a roll of heavy duty 2 faced rubber tape ( I use to hold templates to stock when using straight trimming bits on router table) this tape you could mount a couple locations on the jig to insure that it does not move until you would get at least screw secured. The drawer slide jig has a built in stop that sets the slide back 2 mm. Yet the drawer slide instructions say to mount the slide flush with the cabinet. Why the conflict and which one do you follow? BEST ANSWER: Set the jig flush to the cabinet. The 2mm set back allows the drawer to fully close. It appears this jig will not work if you mount the drawer slides on the bottom of the drawer. Even at the 0 mark it holds it about 1/4" above the bottom of the drawer. Is this true? If so i will likely be returning. BEST ANSWER: This jig is used to hold the half of the slide that mounts in the cabinet box in place. You measure where you want the bottom of the drawer to be in box and then using the foot place the slide in the exact location on both sides of the box. The 1/4" just becomes part of that overall measurement. I apparently did not state my question clearly. I want to mount the cabinet side of the drawer slide flush with the top of the horizontal stile of the face frame and it appears this jig will not allow that. Unless I am missing something. No the jig assumes that your slide is going to require a minimum bottom clearance. The slides that I used did required a minimum bottom clearance of 1/4" and a top clearance of 5/8". So for me the 1/4" was not an issue. I was doing a stack of drawers a cabinet. For the bottom slide installs I did not use the jig even though the spacing was correct. Instead I found it was easier to use 1/4" spacers and rested the slide on them and the bottom of the cabinet to installed the first set of slides. Then I used the jig for the remaining working my way up the cabinet. If your slides do not require a minimum clearance on the bottom of the drawer to prevent it from dragging on the frame then I would look to install without the jig. My drawer opening is only 3-1/2 inches from top to bottom. 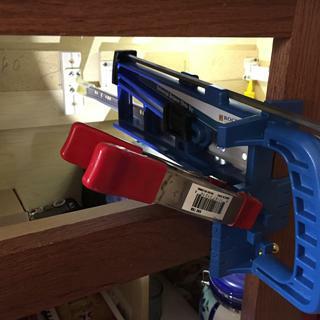 Will the Rockler Universal Drawer Slide Jig fit in that opening?